Not valid on holidays or holiday weekends. Our Meadow Cottages provide the perfect accommodation for golf groups. Each offers a great room and full kitchen, surrounded by 4 bedrooms — each with twin beds and a private bathroom. After your golf round, visit the Clubhouse Grille & Pub to tally your scores and enjoy a Bucket O’ Beer. Or enjoy a Golfer’s Relief massage at the Sleepy Creek Spa to relieve muscle tension. 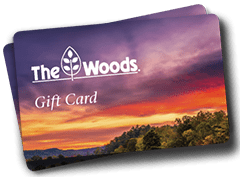 For overnight golf group bookings, please contact our Front Desk at 800-248-2222 or click here to fill out the Overnight Golf Groups Information Request Form. Please Be Aware Golf Packages Are Rain Or Shine. The Woods is a non-metal spike facility. Appropriate attire on the course is required (no jeans/denim). No outside coolers may be taken on the golf courses. 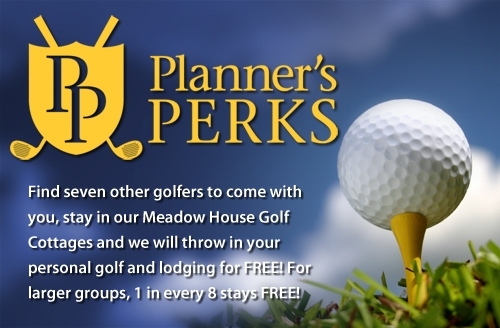 The Planner’s Perks package is available only in the Meadow Cottages.